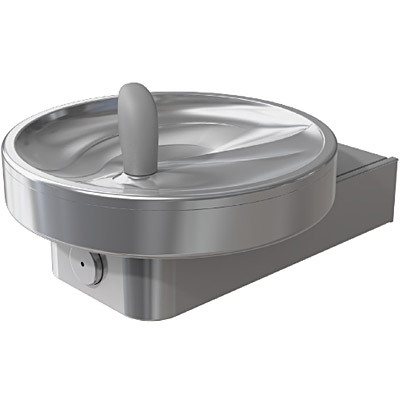 The Sunroc DF-2601 Drinking Fountain shall include a push pad to activate the flow of water. Fountain shall be designed to eliminate splashing and standing water. Bubbler shall have flexible guard and operate between 20 and 120 PSI. Drinking water coolers shall comply with ANSI A117.1-1992 and ADA frontal approach requirements. Listed by Underwriters Laboratories to U.S. and Canadian standards. Shall comply with the Safe Drinking Water Act and Lead Contamination Control Act. Shall comply with ANSI/NSF 61. RADII Modular Fountain meets the needs of the physically challenged and the able bodied. These Water Coolers comply with the requirements of A.D.A. (Americans with Disabilities Act) when properly installed. Also meets the guidelines for children's environments providing the floor to orifice height is 30" or less and proper clear floor space is provided for parallel approach. (Based on Architectural and Transportation Barriers Compliance Board final ruling.) Check Local and State Codes. These Water Coolers are certified to be lead-free as defined by the Safe Drinking Water Act and are manufactured with a waterway system utilizing completely lead-free materials. These waterways have no lead because all lead materials, such as leaded brass, have been removed. All joints are brazed using silver solder only. No lead solder is permitted. Built-in 100 micron strainer stops particles before they enter the waterway. Waterways Are Lead-Free In Materials & Construction.